When you attend the DynaMIND® FundaMENTALS Course you gain an extra edge of mental control, skill, and confidence. Because it is active, and technique-oriented, this course is not available in any book or CD. You learn by doing, in Step-by-step Formulas for Active Self-Directed Mental Processes and tested techniques for specific purposes. Our programs are based on solid concepts in positive psychology, neurology, and neuro-linguistics, combined in a unique, practical, enjoyable learning experience. You’ll free yourself from the common myths and misconceptions behind conventional "positive thinking” (too shallow), popular notions of “visualization” (too limited), and fuzzy “new-age” thinking. Discover what really works. Note that this is not ”mindfulness meditation” or ‘creative visualization” or other forms of “new age” type “meditation”, or “hypnosis”. This is a dynamic, active toolkit to activate the power of your mind. DynaMIND® is quality family time. Bring your kids. Teens ages 12 and up can attend the course. WHAT ARE THE BENEFITS THAT YOU GET? Your mind could be compared to a Bio-computer. Just as fish take water for granted, most people are unaware of their mental programming and its instant daily impact on them. All your beliefs, memories, attitudes, and habit patterns are stored in the mind/brain. These “programs” have a structure and content. This mental software “runs” you on a daily basis. Your thoughts create your experience of reality in demonstrable, objective common-sense ways. Everything you want to be, to do and to have, begins in your mind, and either grows to achievement, or is sabotaged, right there. Your mental and emotional "Programs" are either holding you back, or helping you. 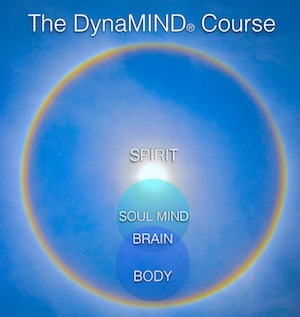 Use the DynaMIND® skills to empower yourself and “hack” your brain. When you change your neural programming, you change your results. Your Mental Programming affects your PHYSIOLOGY: it can speed or slow your heart rate, raise or lower blood pressure, stimulate adrenalin, release digestive enzymes, expand or contract your blood vessels, affect the efficiency of your digestion, stimulate or suppress your reaction to allergens, ramp up or lower your immune system activity. Begin to build the mental and emotional foundation of better health. Your Mental Programs create cognitive FILTERS, through which you usually notice and perceive only those things in the environment which align with what you believe. Your filters can seriously influence your decision-making, personal safety, and relationships. Upgrade and change your filters for better contact with objective reality, therefore better decisions, and increased effectiveness. Boost your self-image and self-confidence for personal and business success. Your Mental Programs generate your FEELINGS, causing you to feel both positive and negative emotions: joy or sadness, anger or calm, depression or well-being, confidence or fear, etc. Change your mental software for elevated mood through the day, managing habitual negative emotional states and enhancing positive emotional states. Free yourself from emotional blocks. Your Mental Programs generate your ENERGY FIELD, molding your physical posture, affecting your brain state, maintaining or depleting your supply of willpower and metabolic energy, and affecting your motivation or weakness about getting things done. Your thoughts accelerate or suppress metabolism and general energy level. Alter your Mental Software for better willpower and energy levels. Your Mental Programs generate your RESPONSES, affecting your automatic or reflexive reactions to people and to situations, both constructive and destructive. Become aware of your Mental Programming and begin to change it for positive and conscious reactions and responses in your life. Get rid of self-defeating habits and attitudes. Your Mental Programs generate your ACTIONS: the decisions you make throughout the day, both the small and daily habits, and the actions or non-actions about your hopes, dreams and goals. Non-action is also a decision. Change old patterns and build motivation, make solid, compelling plans, and move forward in progress toward your goals. You have Review Privileges: Once you have taken DynaMIND® with us, you can attend again and enjoy DynaMIND® refreshers for just the current Review fee, or for free if you are accompanying a first time DynaMIND® student whom you referred, such as a family member or friend. How could you use all this right away? When is the DynaMIND® Course? Click on the MENU symbol, upper right, to find the Schedules page. What's the new lower tuition? Call us or email us and we'll send you the info. Go to TOP RIGHT, to the MENU+ and click on CONTACT. These skills are learned by doing, in class. It’s not difficult at all. Kids get it as fast as adults, so bring your teens (age 12 and up) too. We do mental exercises throughout the course. Graduates love to come back just for the exercises! These exercises are easy, very relaxing and energizing, and enable you to learn and practice the various skills. You’ll learn to access the Alpha-theta brainwave state, firstly for profound deep relaxation and stress relief. You will use this in future to help manage stress so it doesn’t make you sick, grouchy, and ineffective. Secondly, functioning in Alpha-Theta is the fundamental skill to allow you to access beliefs, attitudes, and habits which you wish to change, and to install new programs, habits, beliefs, and physical skills of your choosing. You will build a neurological anchor which enables you to quickly relax, and calm yourself in any situation through the day (in “beta”), and dip into light Alpha for quick re-programming. Very, very useful! Take back your power to choose your reaction. Protect yourself from negative influences, both verbal and energetic, in your work, school, and home environment. Great for work, school, and family reunions! Be very surprised as you become usefully aware of your actual beliefs, attitudes, habit patterns! Discover the unique subjective linguistic, visual, auditory, kinesthetic, and sometimes olfactory and gustatory components of your thought structure. Why? Because knowing that gives you the power to make changes. Use this in Alpha-Theta to take away the power of negative, destructive, inconvenient thought patterns: beliefs, attitudes, habitual behaviours, and inconvenient responses. Use this in Alpha-Theta for alteration and construction of new, positive supportive thought patterns: for beliefs, attitudes, habitual behaviours, and positive responses. You’ll be surprised at how simple, easy changes to mental programs immediately cause visible change. This is a linguistic technique for use in BETA through the day, to redirect your mind towards the constructive and to nip negatives "in the bud". SUBJECTIVE SENSORY TRAINING: The "Genius Thinking" Tool. Your mental or subjective senses are the tools that you think with. You will expand your access to all the modes, and enjoy intensification and practice in all the mental exercises. Use this technique to enhance and improve areas of your choice: for physical skills such as in athletics, dance, or martial arts; for improving communication with the boss or a loved one, enhancing musical skills, such as playing piano or guitar, for acquiring a superb level of preparedness for important conversations, and interviews… and much more. MINDstreaming comes out of research that demonstrated measurable enhancement of IQ. We use it as fun “Boot Camp” for intensification of subjective sense practice, and a dramatic new way that you can brainstorm for ideas, tap into intuition, and build creativity. WHAT'S NEXT? The APPLICATIONS WORKSHOPS. DynaMIND® skills are the fundamental pre-requisite for all the Applications Workshops, which build upon these components. Make sure that you are included in our email news which keeps you informed of the upcoming schedule for DynaMIND® and for Applications Workshops. See the CONTACT button in the MENU top right. “Your programming techniques have been the most IMPACTFUL tool I have ever used! My personal growth and business success has been a direct result of using your programming the past 20 years! Thank you for making goal setting so POWERFUL and FUN! Thanks again for adding colour to my life! !” -Sheron Hoot, entrepreneur, Toronto. “ I rode my bike across Canada to celebrate my 65th birthday. Next year we're doing it again to celebrate my 75th. We've ridden 3,000 kilometers this year. I climbed Mount Kilimanjaro when I was 70. Every night of the five day climb, I Programmed in Alpha to increase my oxygen capacity. I was one of four in our group to make it to the top. I just want to "Thank You" both for giving me the tools to make it all happen.” -Isabelle Sheardown, R.E. Sales, and athlete! SEE TESTIMONIALS page for many more students' reports.